An Interior house painter is a highly skilled man who paints and decorates the buildings in order to protect the houses and buildings from rust, water, and corrosion. He renovates the buildings by giving them a new shinning and fancy look. The house painter furnishes a house with a new look after several processes. It can be the architect of the house, the interior designing of the house, accent wall and painter work. The interior house painter matches the color of the halls, kitchens, corridors, rooms, bedrooms, dining rooms, bathrooms, basements and, doors. The color of the house or building must be selected keeping the architecture, size, designs, and the furniture’s for the house and buildings. The best house painter furnishes the old and damaged parts of the buildings, corridors, doors, rooms, hallways, and basements. The process of interior house painting is a technically dealt by the interior house painters skillfully. This involves the painting of the interior and exterior parts of the doors, windows, corridors, and halls etc. If a single part of the house or building is found defected, their work will be criticized by the owner of the house or building. The color scheme has a very important role in the beauty of the house. It has to be carefully selected from different available combinations. A careful selection of the color for windows, doors, walls, hallways, basements, bathrooms, bedrooms, and kitchen results from a beautiful house. The colors have a strong relationship with the environment. For example; a black color attracts heat, and a white color attracts less heat as compared to the black. The interior house painter has to convince the owners of the house about the color schemes. Once a color scheme has been decided, the paint color and the details of the paints have to be confirmed. 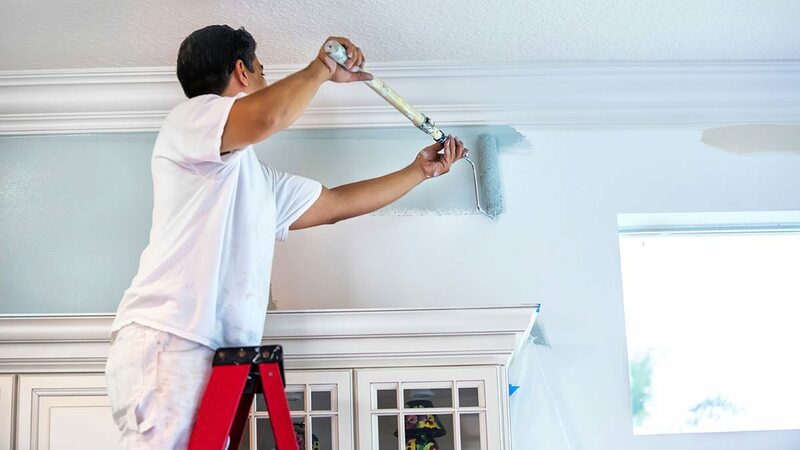 From there the process of interior house painting starts by removing the paintings and fragile items from the areas where the painting is to be done. A complete estimate of the paint color and the required tools including the paintbrush are accurately maintained by an efficient painter. The carpets, floors, furniture, and other necessary utensils for the household are fully covered before painting the house. The holes and cracks present in the doors, corridors, or in any part of the house are completely filled by the professional house painter. Different coats of color and the filling are painted in order to give it a complete strength so that the color could last for a long time. There are different wallpapers available in the market as an alternative to the color. The owner of the house or the building decides the color or wallpaper of his choice to be placed in kitchen or hallways. The wallpaper provides a fancy and beautiful look to the kitchen. The time period of the interior painting of the house and building depends on the size of the house and building, and skills of the interior house painters. The local house painters role in decorating a house is just like decorating a bride for a marriage. They take care of the minute items or elements while painting the house. The home improvement includes many categories but painting interior is beautiful in the decoration of a house. Foothills Painting Longmont provides house painting services for residential and commercial. More information can be found at https://foothillspaintinglongmont.com and for Longmont painters.